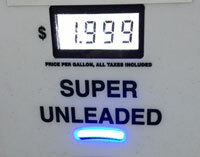 A spokesperson for AAA-Iowa says gas prices could fall again. As you start thinking about summer vacation, AAA-Iowa spokesperson Gail Weinholzer says you might not have to budget as much money for traveling by car. The cost of a gallon of gas in Iowa is well below what it was during the last summer driving season. “A year ago the state of Iowa’s average was $3.58 and today it is $2.37. So, it is a $1.20 or so below were you were a year ago on this date. And we expect prices to remain very low, at least until we head into the summer, if not through the summer,” according the Weinholzer. Weinholzer wouldn’t be surprised if the gas price trend takes a dip. “There’s no reason to expect any significant increases, and in fact, we may see a slight decrease as we approach two dollars a gallon perhaps, as we head into the summer driving season,” Weinholzer says. Iowa gas prices would be even lower, but the Iowa Legislature passed and the governor signed an increase into law that up the gas tax by 10 cents on March 1st.